But for all the thrills that accompany seeing the likes of Gollum, the Hulk and Planet of the Apes’s Caesar on the Big Screen, we shouldn’t overlook the role such technology plays in bringing us films like Paddington 2, where a CGI talking bear can go on misadventures and interact with a host of live-action co-stars in a manner that’s both seamless and, getting to the essence of the movie-going experience, a joy to watch. 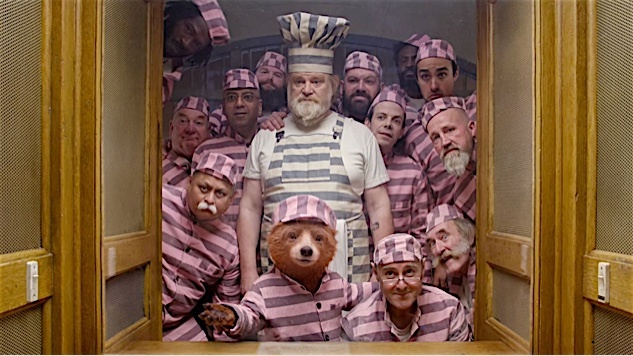 A sequel to 2014’s Paddington Bear, Paddington 2 picks up where its predecessor left off, with Paddington Brown (né Bear and voiced by Ben Whishaw) living contentedly with his human family, including Hugh Bonneville (Downton Abbey) and a newly name-recognizable Sally Hawkins (The Shape of Water), joined by that British A-Lister of yore Hugh Grant, dramatic heavyweight Brendan Gleeson, and many others. (In fact, one of the simple joys for parents watching the film lies in recognizing this or that British actor.) A simple, commendable desire to find a good gift for his Aunt Lucy (currently spending her days in a nice retirement home for bears in Lima, Peru, natch) leads Paddington to set his eyes on a certain antique pop-up book as the perfect present. When that scoundrel and fading thespian Phoenix Buchanan (Grant) also sets his sights on the same book, well, hijinks, misunderstandings and adventure ensue. Paddington 2 reminds us how difficult it can be to pull off a sweetly tempered, gently moving children’s movie by doing exactly that, and doing it so well. Director Paul King’s film is sweet, yet not saccharine. It caters to the humor of children without pandering or talking down to them, and all the while cast and crew take great care to place the narrative solidly in a keenly imagined setting that’s filled with as many stylistic flourishes as a Wes Anderson film. As a result, Paddington 2 is full of far-fetched premises, farcical sequences and, as expected, an intense appreciation of marmalade. It is also a delight to child and adult alike.